The JD(S)-Congress coalition in Karnataka is undergoing teething troubles, especially over the allocation of ministerial portfolios. Both partners are keen on crucial ministries such as power, water resources, revenue, home, PWD and major industries. Chief Minister H.D. Kumaraswamy is eyeing finance, as it would allow him to launch popular programmes, which would look good on the government's report card. Interestingly, the JD(S), which is expected to get 12 of 34 cabinet berths, has only four members with prior ministerial experience. 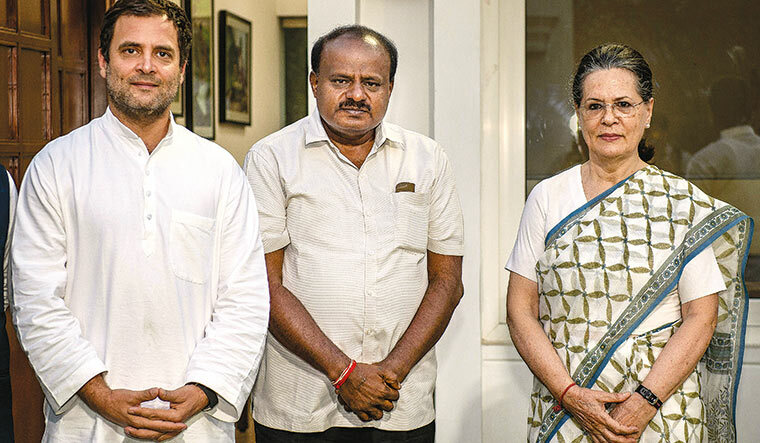 The BJP, with a strength of 104 in the 224-member assembly, will pose a major challenge to Kumaraswamy even as he tries to formulate a common minimum programme with the Congress. On the policy front, the first major task for Kumaraswamy is to fulfil his promise of waiving off farm loans. But, writing off loans availed from nationalised banks alone would cost the exchequer Rs 42,000 crore, which was dismissed as “fiscally imprudent” by the Congress. The new chief minister, however, enjoys the strong backing of the Congress high command, which is keen to showcase its magnanimous side before potential allies. 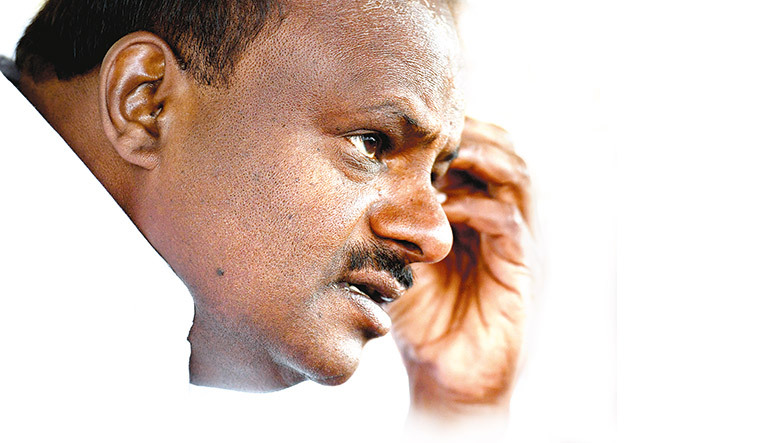 Kumaraswamy, who has not moved into his official bungalow because of poor vaastu, is working from a suite in a Bengaluru hotel. He spoke exclusively with THE WEEK about the dilemmas he is facing and his strengths and limitations in running a coalition government. He also spoke about the events that led to the formation of the coalition, which, he said, would be the base for a grand alliance. Your swearing-in ceremony provided a platform to showcase opposition unity before the next Lok Sabha elections. This coalition will be the base for a grand alliance. Even the prime minister has acknowledged it in his recent statements. The coming together of regional parties and the Congress here is only a preliminary process. We understand that there are many differences in states such as Andhra Pradesh and Telangana, where the regional parties are pitched against the Congress. They might choose to fight alone or join hands. In West Bengal, where the BJP is gaining strength, the Trinamool Congress might forge an alliance against the BJP. Everything is possible. It is too early to predict. Before polls, you had claimed that you would not go with the Congress or the BJP. Who stitched this alliance? The matter of the coalition cropped up only by the afternoon of May 15. By 3.30pm, when the BJP was hovering around 104 seats, the Congress called to say it would extend unconditional support. Within half an hour, we took the final call. I was surprised and so were the state Congress leaders. [State Congress president] G. Parameshwara called me and [senior Congress leader] Ghulam Nabi Azad made the offer. I told them it was too early, as I felt the BJP might get a clear majority. But, they said they had enough material to believe that it would be a hung assembly. So, we rushed to the Raj Bhavan. Why did you rule out a pre-poll alliance with the Congress? The situation was not favourable as we were fighting both the Congress and the BJP. I was confident that the farming community, which has no caste, would support the JD(S). During my tour of north Karnataka, I had got good vibes. I am disappointed with what has happened. Your target was 70 plus seats, but you got only 38. Our target was 75. I believe the BJP got 104 seats not because of hard work, but because of the Congress propaganda against the JD(S). The Congress created fear among the minorities saying the JD(S) was the BJP's B team. I have information that some maulavis (Muslim leaders) and retired bureaucrats formed a team and toured the state for the last 8-10 months to mobilise the Muslim community against us. This is evident from the seats the BJP won. In 20-25 seats, the BJP won because Muslims voted for the Congress. In Ramanagara, I was leading by 26,000 votes. But, as soon as the counting in Muslim-majority booths began, the lead slumped to 150 votes, though I did recover. The Muslim community should introspect, as it has reenergised the BJP. Had we got 50 per cent of minority votes, we would have crossed 70 seats. Which is a bigger threat to the JD(S), the BJP or the Congress? The BJP is a threat to both the JD(S) and the Congress. What made you join hands with the BJP in 2006? After I pulled out of the coalition with the Congress, we wanted to go for fresh polls. But our MLAs had incurred debts during the polls and were not inclined to fight another election. So, I joined hands with the BJP, against my father's wishes, to save my party. But, within two months, the BJP started harassing me. A BJP MLA made graft charges [of Rs 150 crore] against me and also filed an FIR alleging that I had given a supari to kill him. None of the BJP leaders supported me, though I was the chief minister. The BJP calls you a “traitor” for not transferring power after 20 months. It was a drama played out by the BJP's Central leaders, Yashwant Sinha and Venkaiah Naidu, who did not want Yeddyurappa to become chief minister. Had the Central leaders stayed away, the coalition would have survived. It was their larger game-plan to dismantle the coalition, as they did not want me to take any credit for the good work. They also suspected that Yeddyurappa will not be able to match Kumaraswamy's speed. They chose to seek sympathy votes for the BJP and they succeeded. What has changed now, that you agreed to a coalition with the Congress? My decision to join hands with the BJP damaged my father's secular identity. In his 56-year-old political career, he never sought the BJP's support, not even when Atal Bihari Vajpayee wanted to extend support to save his government in 1997. My decision ruined his reputation, and he fell ill. This time, I chose to form a coalition with the Congress to make amends. Many national leaders including Chief Ministers Mamata Banerjee, N. Chandrababu Naidu and K. Chandrashekhar Rao called and advised me to go with the Congress to form a secular government. Will coalition not affect JDS strength and identity as a regional party? Will the coalition affect the strength and identity of the JD(S) as a regional party? The Congress leaders should believe in give-and-take in the right spirit. They should have an open mind and should not play big brother. Going for a seat arrangement in [the] 2019 [Lok Sabha elections], will help us emerge as a major force and overtake the BJP, and, perhaps, win up to 22 seats. The Congress should make use of the opportunity. Everything depends on trust. What happened in Old Mysore that Siddaramaiah was defeated? Our party organisation is strong in Old Mysore, and was perhaps better than others. Will your animosity with senior Congress leaders like Siddaramaiah and D.K. Shivakumar affect the coalition? I have working relations with both leaders. In the Congress, the local leaders always abide by the decisions taken by the high command. This will not be an exception. Will you directly deal with the Congress high command and Central leaders? I am open to interacting even with a party worker, if it can help run the government smoothly. I met Sonia Gandhi and Congress president Rahul Gandhi and Azad. I need to maintain cordial relations with leaders at every level. Do you think the Congress will give you a free hand? I am not a beggar. I never approached anyone to make me chief minister. I will work honestly and expect that they will cooperate with me. Are you confident that the Congress will not do a flipflop after the 2019 polls? We must remember that, in 2004, lack of trust led to the collapse of the coalition. This helped the BJP emerge stronger. I presume none of us will repeat our mistakes. Do you foresee the revival of Janata Parivar? Will you have a role to play in it? Deve Gowda became the prime minister with support from 13 parties. He has earned a lot of respect and goodwill. This is a good opportunity for him to unite the anti-BJP parties. He will not need me. I am interested only in resolving issues concerning the state. Can you waive off farm loans? Did you promise to waive off private loans, too? The government has the resources to implement any challenging policy. I did promise to waive off loans availed from nationalised banks. As I realised that the bigger burden was private loans, I told farmers there was the need for an update on private loans and to evolve a policy to bail them out in future. But, Yeddyurappa played petty politics in the assembly and twisted the facts and claimed that I had promised to waive off private loans. Is loan waiver the solution to farmer suicides? Loan waiver is only a temporary solution. I believe a change in cropping pattern, application of scientific methods, growing crops based on rainfall and availability of water, pesticide-free and export quality crops are all essential. Arecanut and coconut growers are in distress. We can convince farmers to switch over to other crops. A revolution in agriculture sector for infrastructure upgrade, distribution of quality seeds, cold storage and market linkage is needed. This will cost around Rs20,000 crore. Unless we empower the farmers financially, we cannot tackle the agrarian distress. Over the last three years, Karnataka has suffered drought and the crop losses, estimated at Rs58,000 crore. How will the farmer recover such huge losses? When industries suffer losses, the government bails them out. But the farmers, who have no alternative sources of income, are left to fend for themselves. What will be your top priorities? Will you continue the popular (Bhagya) schemes of the previous regime? How will you mobilise resources? Both manifestoes have to be implemented. We will continue pro-people schemes like Anna Bhagya launched by the previous regime after plugging the loopholes. Our list is longer as we have assured pensions for senior citizens, stipends for pregnant women. The revenue generation has doubled in the last five years. We need to plan and implement better, plugging pilferage. Many former CMs and ministers are facing corruption charges. Will you strengthen the Lokayukta? There are many allegations (cases) made against chief ministers and ministers. But, many are politically motivated. People are misusing the office of the Lokayukta for political gains. We need to curb such tendencies. Even I have been a victim of this for the last 12 years. The system has to change. The success of the Lokayukta depends on the guts and integrity of the incumbent. So, I will appoint a good Lokayukta. What are your plans for Bengaluru's development? I formed Greater Bangalore, as the UPA government had just then launched JNNURM scheme to develop cities. The controversial steelbridge project, too, was cleared by me in 2007, to construct a tunnel road from Minsk square to Hebbal flyover. But my government collapsed. What did the subsequent governments do? I wanted to tackle the garbage mafia then and I will do it now. What is your stand on the Lingayat demand for a separate religion status? I believe there are other issues in the state that need immediate attention. How will you resolve the deadlock over Mahadayi issue? Mahadayi issue is not in our hands any more. All three states have made their representations before the tribunal, which has to give a ruling now. Do you feel the current petrol hike is justified? The crude oil prices are much less than what it used to be during the UPA rule. But the Modi government did not transfer the benefit to the consumer. The government must have easily saved at least Rs 5 lakh crore in foreign exchange. What the Centre spent that money on is debatable.